A Professor of Forage Agronomy and Utilisation and the immediate past Director, Centre for Entrepreneurial Studies (CENTS) of the University, Professor Olufemi Onifade, has revealed what the country should do, to increase local production of meat, milk, mutton, veal, hides, skin and other exports. According to the Don, what needs to be done is simply ensuring that the animals producing these products are adequately fed and well taken care of, as this would increase the quantity and quality of animal protein intake of the citizens and generate income for youths in the country. Professor Onifade made the disclosure while delivering the 53rd Inaugural Lecture of the University titled, “Grasses: Production and Management for Sustainable Livestock Industry”, where he enumerated the importance of forage in the stabilisation of soil, serving as cover crop for erosion control, usage as pesticide, feed for ruminants and non-ruminants, medical and recreational activities, among others. 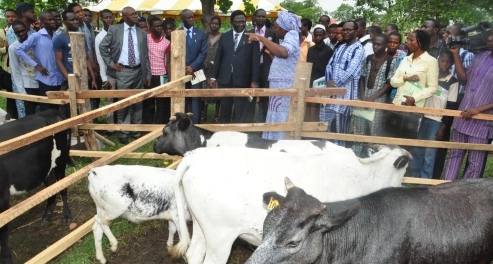 Professor Onifade, who is of the Department of Pasture and Range Management, College of Animal Science and Livestock Production (COLANIM), observed that forage evaluation started long time ago in Nigeria, particularly in Northern Nigeria, where forage species were first evaluated in 1935, which led to the need to focus on pasture, grassland management and to establish more cooperation between livestock and traditional farmers. He noted that between 1956 and 1961, about 271 pasture species were evaluated at various centers in sub-humid zone and at the National Animal Production Research Institute (NAPRI). He added that the livestock industry had contributed tremendously to national economy as the population of ruminant livestock in Nigeria, as at 2013, was estimated at 40,834,000 goats, 19,590,000 sheep and 16,286,000 cattle, adding that agricultural contribution to the nation’s Gross Domestic Product (GDP) was 22 per cent, out of which livestock was 30 per cent. He said that many established pastures were not doing well and failed to last long, while calling for proper planning, identifying fertilizer needs, using of quality seed, land preparation, proper sowing method and proper management of weeds. The Don said that one of his contributions to knowledge was in the area of pasture seed industry for livestock production, noting that seed formed the foundation for the establishment of good pasture species as well as food and feed. Professor Onifade, the Pioneer President, Society for Grassland Research and Development in Nigeria (SOGREDEN), observed that seed industries for food crop were already established in the country, while the pasture seed industry was yet to be adequately developed. He noted that presently, NAPRI and some private farms produce small quantities of pasture, which cannot meet the demand in the country. He, therefore, called on the Federal Government to encourage domestic production of pasture seeds of adapted species by both private and public sectors. Professor Onifade, a former Dean, Student Affairs of the University, noted that if this was done, it would provide an avenue for employment, income generation for the unemployed youths and increase in foreign exchange earnings, among others. The 53rd Inaugural Lecturer, who is also an alumnus of the Ahmadu Bello University, Zaria, concluded his lecture by calling for the training of technical officers in the College of Agriculture, to manage the range-land, noting that education and training were important factors in manpower development. The University Don observed that though the number of graduates with Bachelor of Agriculture, Master in Agriculture and Ph.D were increasing, they still fell below demand. He, therefore, called on the National Universities Commission (NUC), to facilitate the creation of at least, one Department of Pasture and Range Management in each geo-political zone of the country. The Professor of Forage Agronomy and Utilization implored the government and other stakeholders to provide mechanised equipment like fenced paddock, tractors, mowers, choppers, blowers, hay balers and hay rakes, as they would go a long way in increasing feeds for livestock. He further called on state governments to assist in the renovation of the feed resource base to accommodate more livestock in order to reduce unwarranted movement and a number of animals seeking for greener pastures. Speaking at the occasion, the Vice-Chancellor, Professor Olusola Oyewole, disclosed that the Inaugural Lecturer was the third to present a lecture in the discipline of Forage Agronomy and Utilization in Nigeria, the ninth lecture from the College of Animal Science and Livestock Production (COLANIM), the first to be presented from the Department of Pasture and Range Management and the 18th he would preside over as the Vice-Chancellor of FUNAAB. According to the Vice-Chancellor, the Inaugural Lecturer is an erudite scholar, who had published over 40 articles in local and international journals, as well as over 30 articles in refereed conference proceedings and workshops. He has also supervised more than 90 undergraduate projects, 20 M. Agric. Dissertations and 4 Ph.D Theses. Present at the Inaugural Lecture were notable personalities from all walks of life.